I’m really not a huge fan of fitteds because they aren’t waterproof, but the prints are just so cute, they keep sucking me in. I had heard good things about Heartland Dreams, and I wanted one even more after I got the doll diapers her daughter made. I saw a few prints I liked in her store, but I wasn’t quick enough to snap them up. When I saw this fitted, I grabbed it! Something unique I didn’t even notice until the third or so wash, is that Tina seams her fabric in the middle. This way, the print is right side up in both the front and the back. Just another little touch, but it does bug me when the print is upside down! The shape of the diaper and soakers, as well as the fold down rise, remind me of Goodmamas. She also sells one size snappiable/pinnable fitteds, All-in-twos and a 2 stage fitted diapers. I’m currently drooling over this one and this one. Well, the second one is sold but I’m still drooling over it! She also stocks on several congos. She regularly posts when and where she is stocking on the Facebook fan page for Heartland Dreams. In the past, she has also stocked sized pockets (I’d love to try one of those since pockets are my favorite! ), sized fitteds, and other things I’m sure I’m neglecting to mention! This diaper is the first HD I fell in love with but didn’t pounce on. I love that print. *sigh* Poor me. I received my order really quickly after buying. It was packaged really nicely. I always think it’s a nice touch! She included a card with care instructions. with a hand written thank you on the reverse. It’s a small thing, but it’s nice. She also included a free wipe! Heartland Dreams diapers are incredibly well made. They simply don’t look like a diaper that a Mom made on her sewing machine at home. I didn’t go over it with a magnifying glass or anything, but wow. 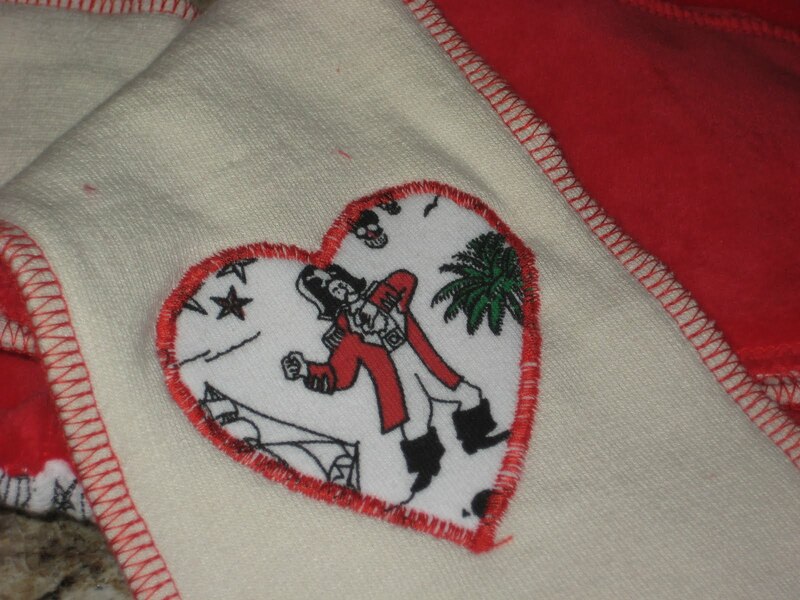 The stitching…everything is very professional. The legs are turned & top stitched to avoid chafing baby’s legs, and the front and wings are serged for less bulk. 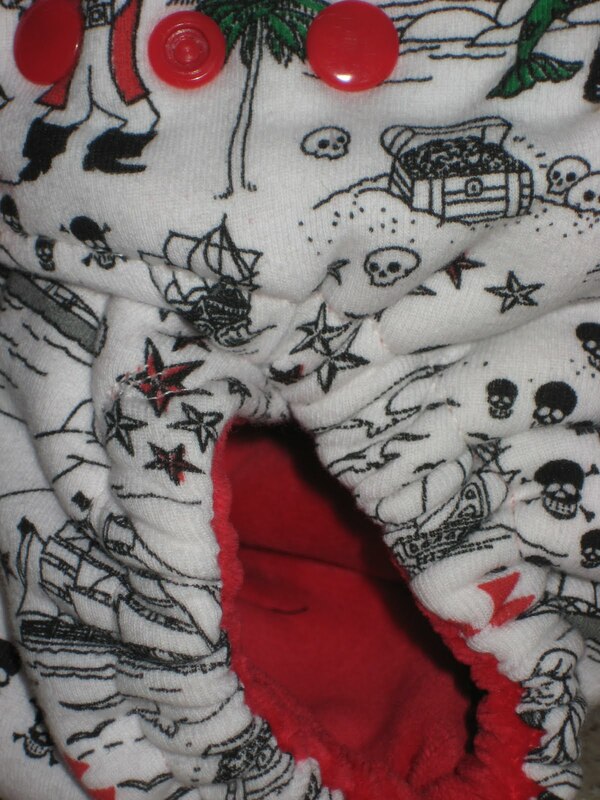 The outside of the diaper is cotton knit, there is a hidden layer of OBF (rayon from organic bamboo fleece)and the inner and soakers are topped with OBV (rayon from organic bamboo velour). They are so soft, and there is a signature heart on the reverse of the soaker that is so cute. Each of the two petals of the snap in soaker has 2 layers of OBF topped with the OBV. Also included is a booster made of two layers of OBF. I think you can see how well made the diaper in in this photo. She includes a set of hip snap covers for when you no longer need the wing cross over, and the third snap is no longer snapped into the diaper. The first time I used the diaper, I just pulled the soakers up, I didn’t fold them at all. All the red spots on my son’s tummy are from the snaps inside our Goodmama One, which he was wearing before this HD. I really do prefer hidden snaps on the inside. The rise folds down, my son is in that in between height and weight where he can really wear it either way. Right side up on the booty too! He had it on (coverless) for about an hour and a half before I noticed any dampness on the outside. On subsequent uses, I folded the soakers and tri-folded the doubler, to get more coverage in the wet zone. Doing that, I was able to use it coverless for 2+ hours. I would definitely use a cover for any situation where there might be compression of course! All in all, I love this diaper. I am really anxious to try one of her all-in-two diapers, since I really prefer diapers that don’t require a cover. (I’m lazy, what can I say?) 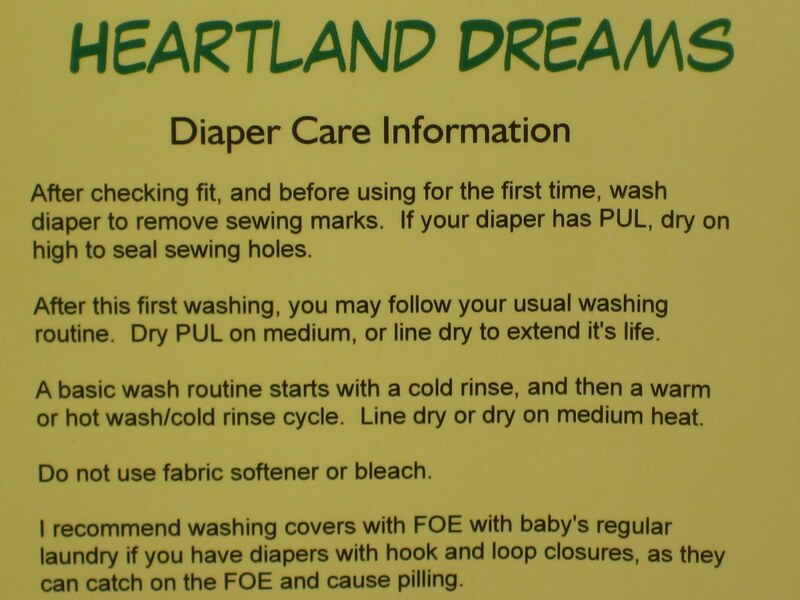 Heartland Dreams are by far, my favorite WAHM diapers to date. The diaper has been in my rotation for a month now and I’ve had no issues at all! Edit August 2010: This diaper is adorable, incredibly absorbent and very well made. It’s not in my regular daytime rotation anymore just because I don’t love fitteds in general. I really want to try a HD AI2! 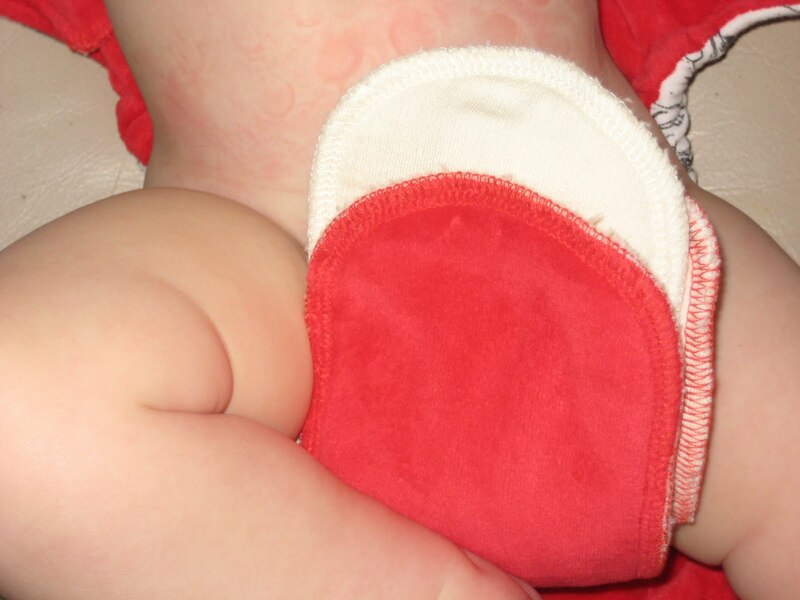 Heartland Dreams One Size Pocket Diaper (Tester) Review! >I'm a new Friday Follower! Visit me at http://www.rockindeals4you.com and sign up for my first giveaway! >Those designs are precious!! !Thanks for the follow! >Thanks for stopping by my blog on FF!! !